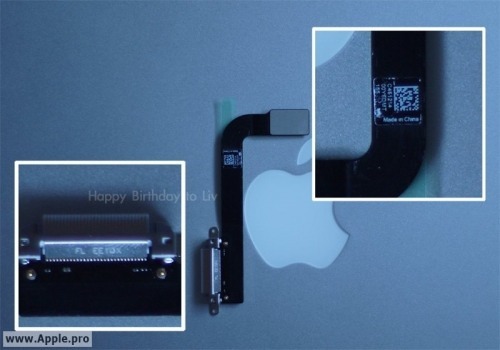 iP3: Photo of iPad 3 Dock Connector Leaks Online? 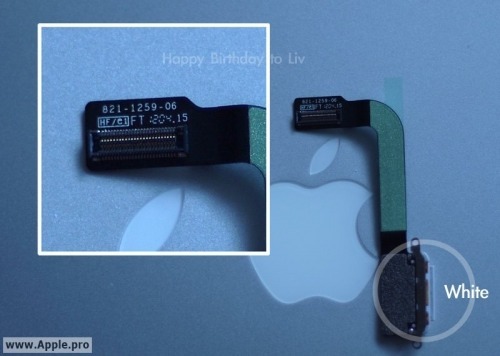 Apple.pro has posted a photo of what it claims is the dock connector and ribbon cable for the next iPad, reports MacRumors. There are of course no guarantees that the part depicted in the photos is indeed a genuine dock connector for the iPad 3 as claimed, but the part carries a very similar form factor to the existing part and a part number updated from 821-1180-A in the iPad 2 to a newer 821-1259-06. The tail end of the ribbon cable also makes a 90-degree turn in the new part, whereas the iPad 2's dock connector ribbon cable is entirely straight. The site observes that the purported part is white; whereas, the iPad 2's is black on all models. It suggests that perhaps the new white connector indicates a modified case design. Rumors of a high resolution iPad 3 or iPad 2 HD have persisted for some time with many reports predicting a release later this year.